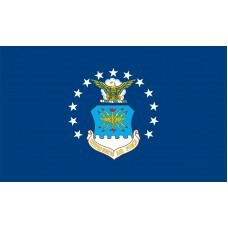 Shop for authentic United States Air Force Flags. 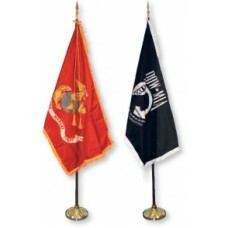 We offer indoor and outdoor Air Force flags in nylon and polyester. Our outdoor flags are finished with a canvas heading, while indoor flags are finished with a lined pole hem and your choice of with or without fringe. 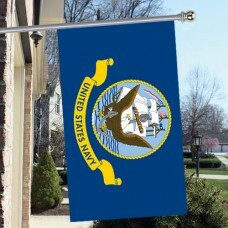 We also offer indoor and outdoor Air Force flag sets. 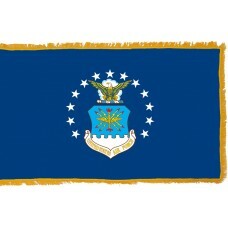 The U.S Air Force Flag features a blue field with the U.S Air Force seal in the center. The seal is surrounded by an arch of thirteen 5- pointed stars. It also features an eagle with a cloud formation behind it, a wreath below the eagle, as well as a shield that is divided into two parts (sky blue and white), which features a yellow thunderbolt with flames and a scroll underneath the shield that writes "United States Air Force." The thirteen stars on the seal represent the thirteen original colonies, and the top three stars represent the three departments of the Department of Defense, which are, army, navy, and air force. The Eagle represents the United States of America, the clouds represent the beginning of a new sky, and the thunderbolts on the shield represent the power through air and space. The U.S Air Force Flag was adopted on March 26th, 1951, by President Harry. S. Truman and is used during parades and ceremonies. The U.S. Air Force is a branch of the U.S. armed forces concerned with the aerial and space warfare during military operations. It was first established as part of the U.S. army on August 1st, 1907. The army wanted to establish an aeronautical division to "take charge of all matters pertaining to military ballooning, air machines and all kindred subjects." The first plane was accepted on August 2nd, 1909 and was known as "Airplane No.1." In 1911, there was only one airplane still and one pilot, but by 1913, more men had been taught to fly and there were 24 authorized pilots and an aero organization was finally established that was capable of dealing with military operations. In 1913, in Texas, the first aero-squadron was organized in case of emergencies and unexpected attacks. In September 1914, the new aero-squadron flew its 9 airplanes with the 2nd division to guard the Mexican border. During World War I, the United States of America only had a small number of planes and pilots compared to other countries. There were only 6 aircrafts, 12 officers, and 54 enlisted men. Following World War I, it became apparent that airplanes now had a lot of influence and played a major role during battles so a lot of money was invested to increase and strengthen the U.S. air division. In 1920, the air service became an actual branch of the army and in 1926, it was renamed to "Army Air Corps." During World War II, in September 1941, the Army Air Corps became part of the Army Air Forces and on March 9th, 1942, the army air forces had an equal role with the army and with the navy. On September 18th, 1947, the army air force became separate and independent and the youngest branch of the armed forces. Today, the U.S Air Force is one of the biggest air-forces in the world as well as the most advanced. The U.S. Air Force now consists of approximately 5,369 military aircrafts, 170 military satellites, an enlisted force of 288,720 and 69,466 officers.